If it takes a while to put a finger on Fort Lauderdale’s pulse, that’s just because it’s a city with so many different heartbeats. Fort Lauderdale has long since bid farewell to the collegiate debauchery that reached its pinnacle in the ’80s, making it an excellent place for millennials, families, and snowbirds alike to discover a cool cocktail of artsy sophistication, retro-kitsch, and timeless seashore merriment. One could argue that Fort Lauderdale’s heyday is happening right now. Here are three ways to delve into its multifaceted spirit. Fort Lauderdale is best seen from the water, particularly from a water taxi. Motoring through the city’s extensive network of waterways, it becomes clear why the city is known as the Venice of America. Your first mate yuks it up with bad puns and insider tales of how the one percent lives as you meander along canals lined with breezy palms, multimillion-dollar homes, and tony yachts. The sixth stop connects to the Hollywood line, which cruises along the Intracoastal Waterway past the ships in Port Everglades and south to Hollywood Beach. On the deco-style terracotta “Broadwalk,” pick up bikes at Sun and Fun Cycles and pedal along Hollywood’s gorgeous, white sand beach — sun worshippers can rent chairs and an umbrella from several beachfront outfits. For lunch, try the Quarterdeck Seafood Bar on the Dania Beach pier, a leisurely two miles away. Find a perch overlooking the Atlantic, grab an Islamorada Ale, and order the lobster roll. Fort Lauderdale’s watery underworld offers another aquatic dimension to be explored, with 23 miles of the Florida Reef Tract a short distance from shore. Two snorkeling trips a day depart from the Bahia Mar Marina aboard the Sea Experience, a glass-bottomed boat that takes you to a section of reef with corals and prolific marine life. Or, a couple of miles north, in the quaint beach town of Lauderdale-by-the-Sea, rent gear at Gold Coast Scuba and wade into the water at Datura Avenue with extensive reef habitat just 100 yards from shore. The easy access and shallow depths make this a great spot for newbies to try out their fins. My initiation into Fort Lauderdale’s tiki culture took place at the Mai Kai Restaurant, a spot long considered the nation’s epicenter of Polynesian Pop. Built in 1956 and added to the National Register of Historic Places in 2014, the Mai Kai, and its lavish Islander Revue dinner shows, remains a mecca of South Pacific flair. Start the evening in the Molokai Bar, where original set pieces from Mutiny on the Bounty contribute to the nautical decor and the gentle strum of the ukulele fills the air. The recipes for the Mai Kai’s 57 rum cocktails are closely guarded — mixologists sign a contract promising never to reveal their secrets — and most date back to the ’50s. Garnished with an orchid and a sprig of mint, the classic Mai Tai works wonders to get you into the island spirit. At the Wreck Bar, cocktails and fishtails reign supreme during the historic lounge’s well-loved mermaid show. One of the last “porthole bars” in the United States, the Wreck Bar, located on the lobby level of the beautifully revamped B Ocean Resort, has been serving up hefty doses of rum and kitsch for decades: The lounge was once the stomping grounds of Joe DiMaggio and Marilyn Monroe back in the hotel’s famed Yankee Clipper days. Arrive early for a good seat — MeduSirena Marina and her talented school of mermaids draw a crowd. For a modern-day fusion of rockabilly and tiki-chic, seek out Kreepy Tiki. Housed adjacent to a tattoo parlor in what seems an unlikely venue on South Federal Highway, not far from the airport, hipster bands play several nights each week while potent concoctions are crafted at the thatched-roof bar. I was one of the only people in there over 25, but the dude at the door still insisted on checking my ID. A smattering of venues, including the Broward Performing Arts Center, the Florida Grand Opera, and the NSU Art Museum, which has blossomed into an important showcase of contemporary artwork, have their homes within the Riverwalk Arts and Entertainment District. In Himmarshee Village, you’ll have plenty barstools to choose from at hip gastro-pubs and eclectic eateries along Southwest 2nd Street. Himmarshee Public House is a local favorite, featuring small plates of global comfort food like spicy Kung Pao wings, smoked brisket nachos, and root beer glazed lamb ribs along with craft brews and artisanal cocktails. Nearby, the O-B House consistently gets tapped as the city’s best breakfast spot for belly-filling favorites like flaky home-baked biscuits with sausage gravy, cheesy southern-style grits, and fluffy cast-iron buttermilk pancakes. Fort Lauderdale has long stood out as a welcoming vacation destination for LGBTQ travelers, and nearby Wilton Manors ranks second only to Provincetown as the gayest city in America. Stroll along Wilton Drive and pop into Out of the Closet to scour racks for funky thrift shop finds or stock up on nostalgia and sweets at To the Moon Marketplace. The newest addition to the neighborhood is Bubbles and Pearls, “Top Chef” celebrity Josie Smith Maleve’s emporium to bubbly and bivalves. Celebrate your travels with a glass of champagne and a flight of crisp oysters. 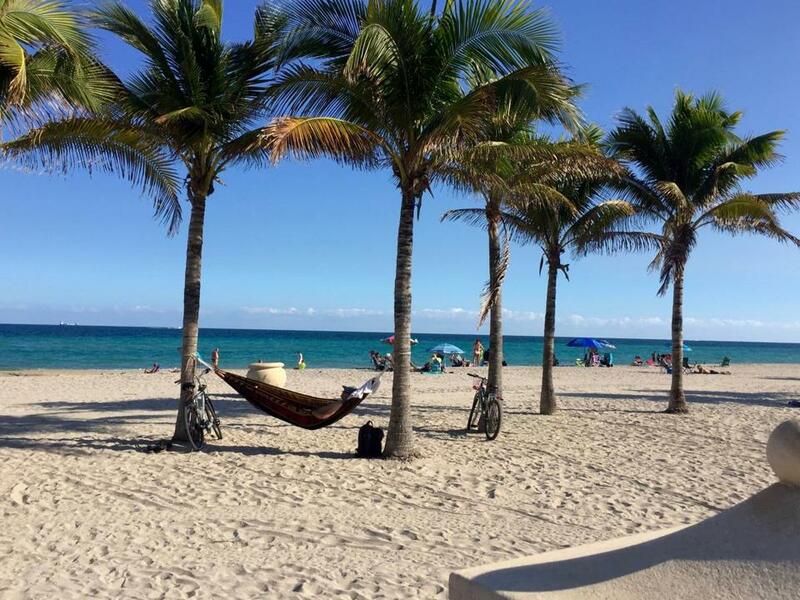 Folks tend to travel to Fort Lauderdale for its beach, so staying nearby is a must. For the perfect fusion of old school, 1950s-era digs and trendy beach retreat, check into the Ikona Hotel, a chic boutique property that opened on Bayshore Drive last summer. Rooms overlook the pretty courtyard and pool while two penthouse suites enjoy views of the ocean, half a block away — waking to the sight of palm trees silhouetted in the pink-gold sunrise is a delight. Though the ship-shaped Yankee Clipper hotel has drawn guests for decades, the iconic beachfront resort was long overdue for an overhaul. Following a multimillion dollar renovation, the B Ocean Resort was christened in late January and features spacious, airy rooms, many with balconies overlooking the ocean, dining in the new Naked Crab restaurant conceived by celebrity chef Ralph Pagano, and new touches in the Wreck Bar, home to Lauderdale’s famous mermaids. Gina Vercesi can be reached at gdvercesi@gmail.com.